I love my African Black Soap Body Wash by Nubian Heritage. Its makes my skin feel so refreshing! 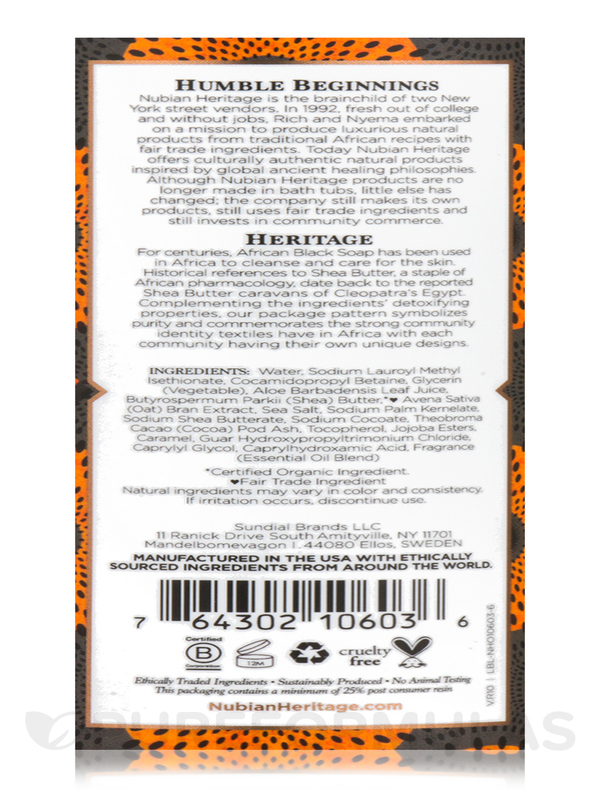 I like the sweet sensual smell of African Black Soap Body Wash by Nubian Heritage not so strong aroma. 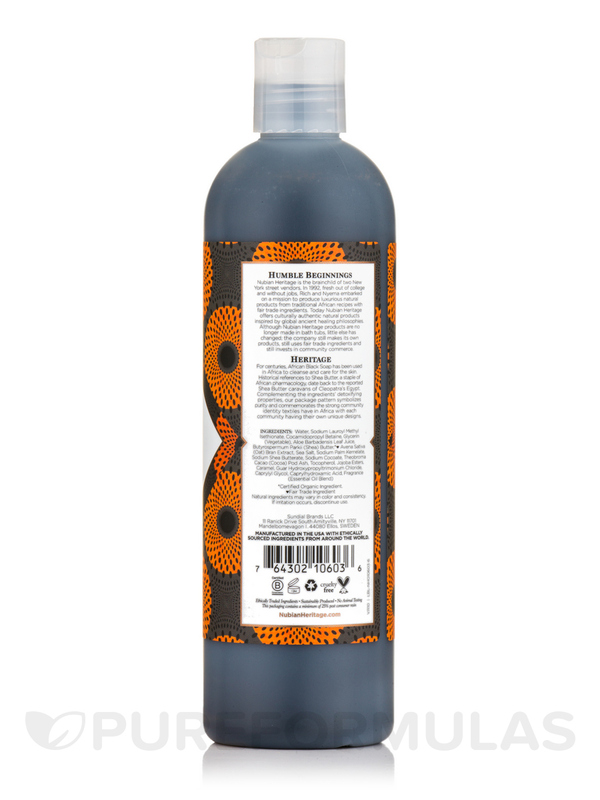 African Black Soap Body Wash by Nubian Heritage is one of my favourite shower gel leaves me feeling clean yet not drying. Acne Fighting‚ Detoxifying & Healing! Treat skin to a total cleansing experience with this combination body wash that helps combat the appearance of breakouts while gently exfoliating from head to toe. Mineral-rich Dead Sea Salt and Jojoba Beads slough off dead skin while Oats and Aloe Extracts soothe skin. The high concentration of Shea Butter maximizes moisture retention revealing healthier looking skin. Water‚ sodium lauroyl methyl isethionate‚ cocamidopropyl betaine‚ glycerin (vegetable)‚ aloe barbadensis leaf juice‚ butyrospermum parkii (shea) butter‚ *†Avena sativa (oat) bran extract‚ sea salt‚ sodium palm kernelate‚ sodium shea butterate‚ sodium cocoate‚ theobroma cacao (cocoa) pod ash‚ tocopherol‚ jojoba esters‚ caramel‚ guar hydroxypropyltrimonium chloride‚ caprylyl glycol‚ caprylhydroxamic acid‚ fragrance (essential oil blend). Apply to washcloth or hands. Cleanse entire body. Daily use will result in balanced‚ healthier looking skin. Very concentrated so you don't need to use a lot. African Black Soap Body Wash by Nubian Hertiage makes my skin so soft and smells great. I left my body wash at sisters house . 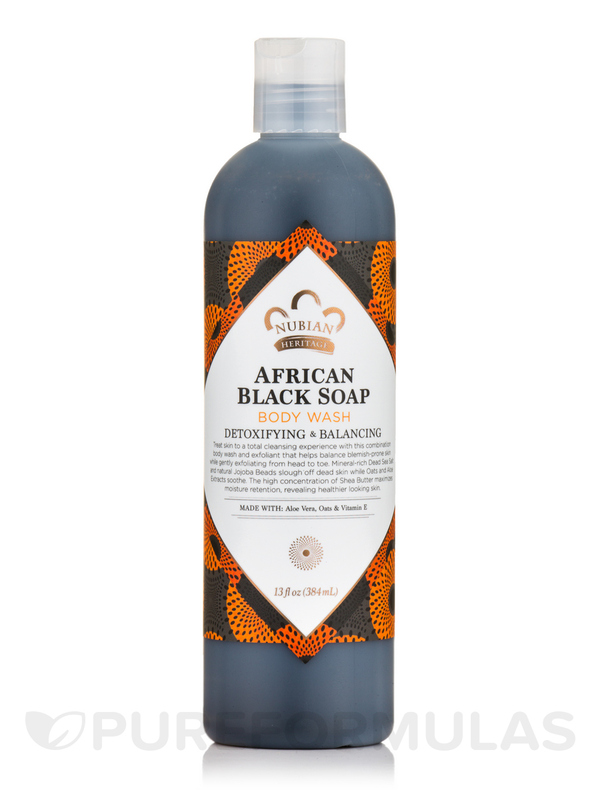 African Black Soap Body Wash by Nubian Heritage has a very nice smell, good for problem skin. I love African Black Soap Body Wash by Nubian Heritage body wash . First it has a wonderful scent that lingers after showering. Seconds the small beads play a great role in the message Like felling while using it. The smell is wonderful! I feel wonderful using African Black Soap Body Wash by Nubian Heritage! I will buy to give as gifts! My skin is very sensitive so the 100% raw black was a little too much for me. African Black Soap Body Wash by Nubian Heritage works amazing for my skin and smells great too. I love its smell, cleans well but also moisturizing.Since using African Black Soap Body Wash by Nubian Heritage my skin is soften and acne less appears. The color slightly stain my towel bit it goes away. I love African Black Soap Body Wash by Nubian Heritiage! The sea salt makes a nice exfoliator. This soap cleans really well and leaves skin feeling nice and smooth afterwards. Pleasant sandalwood smell. I am trying all the different body washes by Nubian heritage, one by one, and have loved them all so far.